Manage your entire third party marketplace selling operations efficiently with eShopCONNECTED. Use eShopCONNECTED for your third party marketplaces and enjoy all the benefits that Connected Business has to offer for your business. eShopCONNECTED is part of our Connected Business COOP. It is provided free of charge, but support and new feature requests are handled through our network of partners. Sell easily through online marketplaces with Connected Business using eShopCONNECTED. 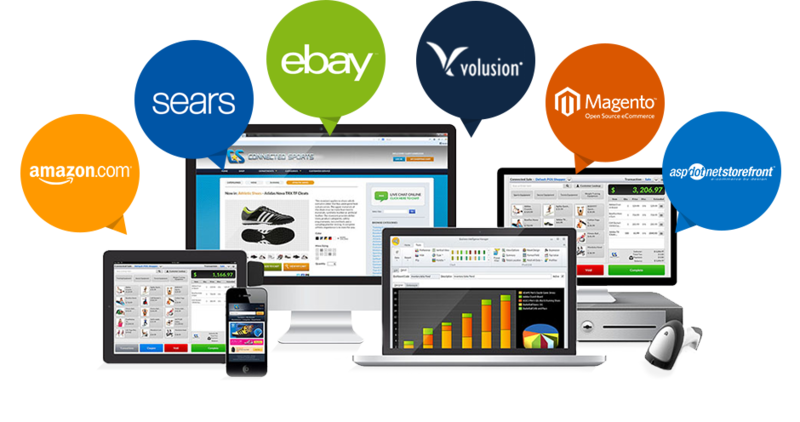 With eShopCONNECTED manage one or more ECommerce sites on Magento, Volusion or ASPDotNetStorefront and take care of sales, inventory and accounting activity through Connected Business. eShopCONNECTED allows you to easily set selling preferences and rules into marketplaces including Amazon, eBay, Shop.com and Channel Advisors. Sell more through online marketplaces with eShopCONNECTED. With eShopCONNECTED you are not limited to one type of eCommerce shopping cart. Leverage the benefits of selling through multiple web carts while centrally managing your business data within Connected Business. Orders are automatically imported into Connected Business back office application for fulfillment. When orders are shipped, order statuses are then passed back to webcarts giving your customer real time status of their order. eShopCONNECTED comes with easy to use wizards and Inventory import tools to upload data from existing systems or download inventory from an existing cart, making it easy to switch to Connected Business from other ERP software. eShopCONNECTED is Freeware that is supported by the Connected Business COOP, a partnership between Connected Business, our Customers and Partners. Sell your products through one of the largest online marketplaces easily with eShopCONNECTED. With eShopCONNECTED, orders from Amazon are automatically downloaded into your Connected Business back office application. Get updated on the latest item orders from your Amazon account as they happen. Fulfilling online orders is easier with eShopCONNECT. eShopCONNECTED automatically updates order information from your Connected Business back office application into your Amazon account. Once you've fulfilled your Amazon orders you can send back the information to Amazon so your customers can get updated as well on their orders. Automatically import your inventory information from Amazon whenever they are updated, and keep your Connected Business back office application updated as well. eShopCONNECTED automates the whole process of updating your inventory from Amazon to Connected Business. You can have multiple online marketplace accounts with eShopCONNECTED. Sell more and grow your business online as you connect your business to more online marketplaces and sell more. Connect your business to Fulfillment by Amazon using eShopCONNECTED and Connected Business. With eShopCONNECTED, orders from Amazon are automatically downloaded into your Connected Business back office application. Get updated on latest item orders from your Fulfillment by Amazon account as they happen. Fulfilling online orders is easier with eShopCONNECT. eShopCONNECTED automatically updates order information from your Connected Business back office application into your Fulfillment by Amazon account. Once you've fulfilled your Fulfillment by Amazon orders you can send back the information to Fulfillment by Amazon so your customers can get updated as well on their orders. Automatically import your inventory information from Fulfillment by Amazon whenever they are updated, and keep your Connected Business back office application updated as well. eShopCONNECTED automates the whole process of updating your inventory from Fulfillment by Amazon to Connected Business. Retailers of all sizes can take advantage of eBay.com's vast customer reach with eShopCONNECTED and Connected Business. With eShopCONNECTED, orders from eBay are automatically downloaded into your Connected Business back office application. Get updated on latest item orders from your eBay account as they happen. Fulfilling online orders is easier with eShopCONNECT. eShopCONNECTED automatically updates order information from your Connected Business back office application into your eBay account. Once you've fulfilled your eBay orders you can send back the information to eBay so your customers can get updated as well on their orders. Connect your existing Channel Advisor service to Connected Business through eShopCONNECTED. With eShopCONNECTED, orders from Channel Advisor are automatically downloaded into your Connected Business back office application. Get updated on latest item orders from your Channel Advisor account as they happen. Fulfilling online orders is easier with eShopCONNECT. eShopCONNECTED automatically updates order information from your Connected Business back office application into your Fulfillment by Amazon account. Once you've fulfilled your Channel Advisor orders you can send back the information to Channel Advisor so your customers can get updated as well on their orders. Automatically import your inventory information from Channel Advisor whenever they are updated, and keep your Connected Business back office application updated as well. eShopCONNECTED automates the whole process of updating your inventory from Channel Advisor to Connected Business. Integrate your business with product comparison marketplace Shop.Com with eShopCONNECTED. 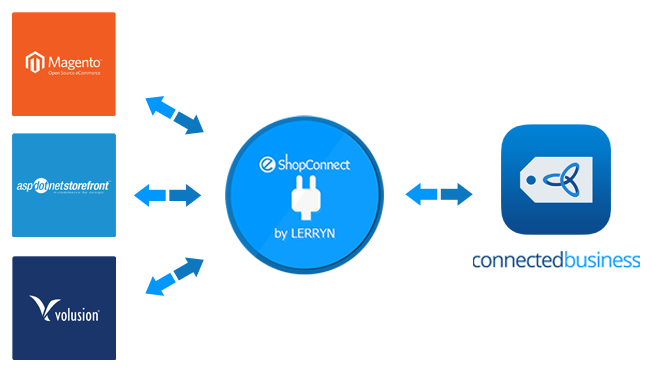 With eShopCONNECTED, orders from Shop.com are automatically downloaded into your Connected Business back office application. Get updated on latest item orders from your Amazon account as they happen. Fulfilling online orders is easier with eShopCONNECT. eShopCONNECTED automatically updates order information from your Connected Business back office application into your Shop.com account. Once you've fulfilled your Shop.com orders you can send back the information to Shop.com so your customers can get updated as well on their orders. Sell more with the vast network of Shop.com's customers easily through eShopCONNECTED. You can publish your entire sellable inventory on Connected Business online for customers to find, so you can sell more and worry less on your inventory management. Open your business to a large network of online buyers with eShopCONNECT and Connected Business. 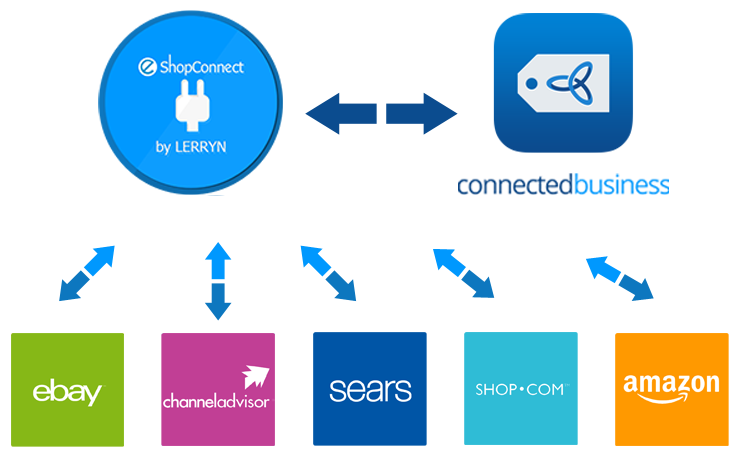 With eShopCONNECTED, orders from Sears.com are automatically downloaded into your Connected Business back office application. Get updated on latest item orders from your Sears.com account as they happen. Fulfilling online orders is easier with eShopCONNECT. eShopCONNECTED automatically updates order information from your Connected Business back office application into your Sears.com account. Once you've fulfilled your eBay orders you can send back the information to eBay so your customers can get updated as well on their orders. eShopCONNECTED global marketplace connectors are separate connectors providing the ability to sell products into different global market places while managing the subsequent fulfillment, accounting, and CRM processes directly from Connected Business. eShopCONNECTED will download orders and update subsequent order status from different global marketplaces for shipping and fulfillment processes to happen from within Connected Business. eShopCONNECTED will also update inventory levels for some modules for easier inventory display and management. Sell on popular marketplaces with ease and manage your account and purchase information directly from within Connected Business' interface. With Connected Business' advanced inventory management and financial capabilities, selling on multiple channels has never been this straightforward. Automatic Order update push back to web site. Inventory Import from web site. Inventory publishing to web site from Connected Business. Multi-Site enabled to connect to multiple web sites. Fully GAAP compliant ERP/CRM software to centrally manage all business activity. Integrated accounting system with financial reporting for profit/loss, earnings statements and much more. The ability to manage multiple sales channels through eShopCONNECTED. Easily add more sales channels to eShopCONNECTED. Integrated Shipping Tools for fulfillment options including packing slips, picking lists, and customer order update notifications. Integrated Supply Side Management Tools through Connected Business with options for drop shipping and automated purchasing options. Web Services integration is available for EDI links to Suppliers. Complete CRM suite of tools for managing customer activity and marketing efforts including tools for generating targeted campaigns, mass emails and call lists and more. eShopCONNECTED for Webcarts is a module-based product with different connectors, each of which will connect Connected Business to different eCommerce shopping carts. eShopCONNECTED eCommerce Connectors provide the ability to centrally manage eCommerce activity through Connected Business to centrally manage the subsequent fulfillment and accounting actions from eCommerce sales creating a complete an end-to-end software solution to manage a business. Automatic Order Import from web site. *XML Import Tool - A Generic Order Import tool for connecting with additional carts for an Order Import and Order Status Check only. Contact us to use this with other carts.